Former Secretary of State Hillary Clinton is facing a new round of questions about her handling of the 2009 coup in Honduras that ousted democratically elected President Manuel Zelaya. Since the coup, Honduras has become one of the most violent places in the world. Last week, indigenous environmental activist Berta Cáceres was assassinated in her home. 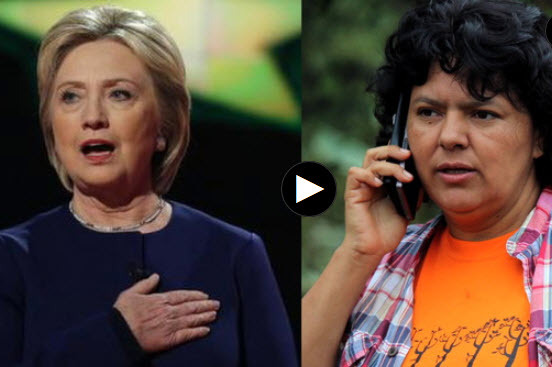 In an interview two years ago, Cáceres singled out Clinton for her role supporting the coup. “We’re coming out of a coup that we can’t put behind us. We can’t reverse it,” Cáceres said. “It just kept going. And after, there was the issue of the elections. The same Hillary Clinton, in her book, ‘Hard Choices,’ practically said what was going to happen in Honduras. This demonstrates the meddling of North Americans in our country. The return of the president, Mel Zelaya, became a secondary issue. There were going to be elections in Honduras. And here she [Clinton] recognized that they didn’t permit Mel Zelaya’s return to the presidency.” We play this rarely seen clip of Cáceres and speak to historian Greg Grandin.